After an elephant fell during a dangerous circus stunt, his companions rushed into the arena to check on their friend. Elephants are extremely empathetic. Sadly, most humans do not regard the majestic beasts as feeling, intelligent creatures, and it’s for this reason that millions continue to suffer today. In the video below, an elephant can be seen performing a dangerous stunt and then attempting to dismount. Before he can reach the ground, however, the pyramid of stools begins to crumble and, in effect, the elephant falls a painful six feet to the ground. Audience members can be heard screaming as authorities attempt to keep all attendees calm. This is disgusting. These majestic creatures deserve better than to be paraded and forced to perform senseless circus acts for our entertainment. 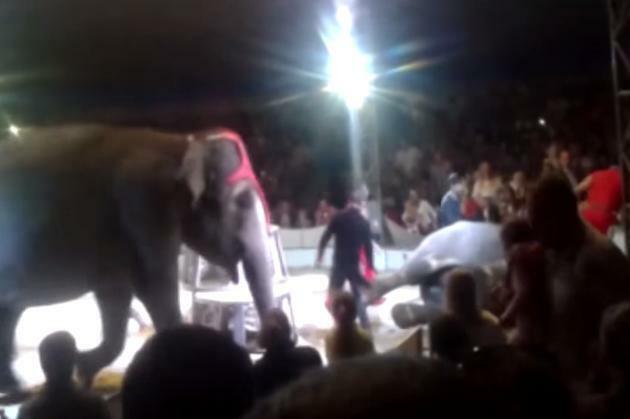 Please share and get the message out there, forcing an animal to perform circus acts is abuse! He Saved A Tiny Animal, But Had No Idea What It Actually Was.